Those who do not speak Japanese – myself included – must rely on the feeling, the performance and passion behind each song in order to truly appreciate each track. Even with the helpful liner notes, the listener must immerse themselves in the music. Thankfully, each track chosen for this collection reaches out and grabs the listener on first listen. Most of the tracks are gentle and reveal their beauty during that first spin. Sachiko Kanenabu’s “Anata Kara Touku E” is haunting yet beautiful. Kazuhiko Kato’s “Arthur Hakase No Jinriki Hikouki” sounds like a Donovan song that made it’s way onto The Beatles’ WHITE ALBUM - which doesn’t seem so far-fetched since Donovan spent time with the Fabs in Rishikesh in 1968. 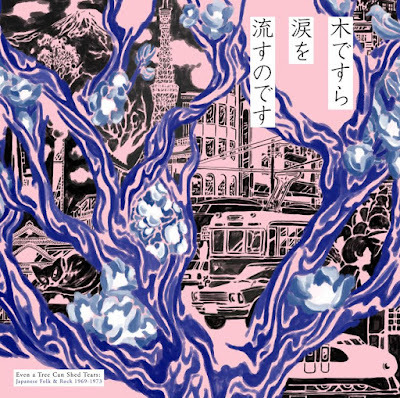 Takashi Nishioka’s “Man-in No Ki” blends traditional Japanese Folk music with a nod to Western Psych-Folk. Maki Asakawa’s “Konna Fu Ni Sugite Iku No Nara” is a beauty of a song built around an acoustic reinvention of standard rock chord progression. Hachimitsu Pie’s “Hori No Ue De” sounds like a sorrowful plea inspired by CSNY’s “Helpless” if it had appeared on Carole King’s TAPESTRY. Neil Young’s influence also bleeds into Ryo Kagawa’s “Zeni No Kouyou Ryoku Ni Tsuite”. With performances that range from wistful to dramatic, EVEN A TREE CAN SHED TEARS: JAPANESE FOLK & ROCK 1969-1973 is an eye (and ear) – opening experience for anyone remotely interested in Folk and Protest music. Even with the language barrier, this release reveals so much about this time period in Japan. This is not just a release for Rock historians – it is a collection that will resonate with listeners nearly 50 years after it was recorded.